The One-for-All Swing Seat levels the playing field by making the playground swing accessible for children with disabilities. Now children of all abilities can enjoy the exhilaration of a playground swing with an ADA compliant comfort support fit. Make your commercial playground accessible to children with mobility issues within your community. Did you know that there are a number of health and developmental benefits to the natural swinging action during play? Hand eye acuity, balance and other skills can be improved including core torso strength and dexterity, simply by the momentum of a swing. The torso harness is designed to secure children aged 2-5 or 5-12 years with chest and pelvic straps to equalize pressure during movement and prevent falling. This commercial swing seat can be ordered and installed on a single bay to toddlers through pre-teens with special needs. 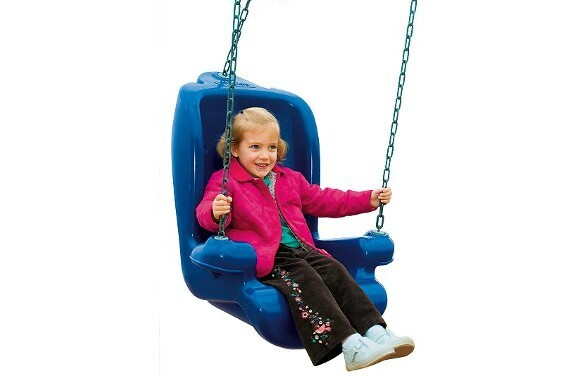 The seat is manufactured with rotational molded plastic construction, which provides a comfortable finish for seating and durability for outdoor use. The One-for-All Swing Seat is suitable for in-school or residential use, as well as in commercial or therapeutic environments, and up to two swing seats can be installed on a single bay, and comes as a complete kit with all the accessories needed for installation, including seat, hardware, swing chains, and top bar connectors, but the optional seat restraint is sold separately. Are you adding ADA accessible and compliant playground elements to your park or community? 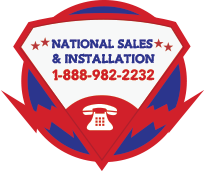 Contact an American Playground Company customer service representatives at 1-888-982-2232. We'll work with you to get you a quote for all your commercial playground equipment needs, including play structures, swing sets, site furnishings (including tables, benches, trash receptacles, and even commercial shade structures); and we'll even organize installation and freight costs.